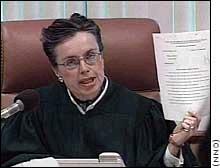 (Orlando, FL) Today, Judge Cindy S. Lederman, a trial court judge in Miami has ruled that Florida’s law prohibiting homosexuals from adopting children was unconstitutional justifying her ruling under the “equal protection” clause of the Florida Constitution. Judge Lederman ruled that the state had no “rational basis” for denying homosexuals the ability to adopt children. John Stemberger, chairman of the successful drive earlier this month to pass a constitutional amendment banning gay marriage in Florida, called the ruling “classic judicial activism” and predicted it would be reversed on appeal. Other states that do not allow homosexual adoptions either by law or by practice include Mississippi, Utah, Oklahoma, North Dakota, and Arkansas.